Purple is such a wonderful color. Symbol of royalty, faith, wisdom and, of course, passion, no one can fail to be inspired by its use. The love of the color purple is interpreted here in Passion Watercolours using the double-fan-doubled stitch, a sign of controlled but radiant warmth. Worked on 18 count lavender canvas, this piece uses a variety of luxurious threads, including Passion Watercolours, Grandeur silk pearl, Impressions, Kreinik metallics, Coronet braid, and #8 overdyed and solid pearl cotton. 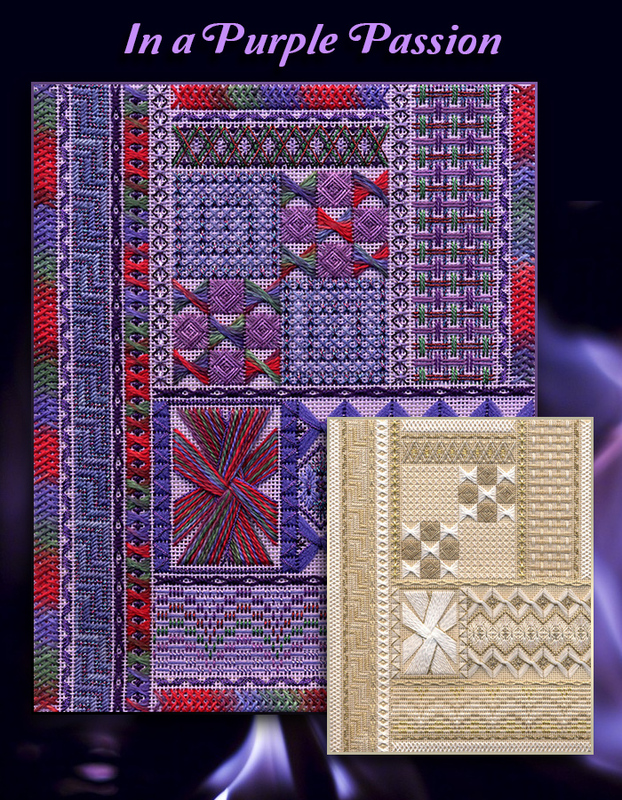 Essentially a stitch sampler, this piece includes a variety of composite and pattern stitches, beginning with the double fan doubled, and continuing with borders and squares of spring stitch, half Rhodes, cashmere Byzantine variation, braided knitting, sprat’s head, shadowed cross stitch, laid plaid, and burden stitch. Don’t like purple? Don’t have a place for purple in your home? Work the same piece in an elegant white and gold combination, worked on ecru canvas. Snow White Watercolours is accented by shades of gold metallic and soft ecru overdyed pearl.